The Girlhood of Mary Virgin was arguably Rossetti's first mature painting. Completed the year after he had cofounded the Pre-Raphaelite Brotherhood (in 1848) Rossetti intended to show the painting that spring at the Free Exhibition at the Hyde Park Corner Gallery. The canvas shows the young Virgin Mary seated at a table with her mother, Anne, as the two embroider a lily. In the background, Mary's Father, Joachim, reaches to prune a vine in a luscious green garden which has been visited by a haloed dove. At the women's feet are a crossed palm branch and thorn. On the left hand side of the picture frame is a child angel who waters a vase with the prop of the lily. The flower rests on a stack of educational books labelled: Charity, Faithfulness, Hope, Prudence, Temperance, and Fortitude. The childhood of the Virgin Mary was a common subject from medieval religious painting. However, Rossetti chose not to depict a straightforward bible scene but preferring to steep his narrative with luminous colors and symbolic meanings. The dove represents the Holy Spirit, the Vine leaves Christ himself, the Palm and Thorn, Palm Sunday and the Crucifixion, and the Lily represents Mary's purity. The significance of the young Mary embroidering a lily from nature has been commented upon, as it references the Pre-Raphaelites own reverence for the natural world. It also lays a significance on embroidery, and the decorative arts in general, not being a lesser craft (or a mere guild) but rather an important, and even semi-spiritual or meditative, practice. Another un-orthodox factor of the painting was the way Rossetti used family members as models for the religious figures. The Virgin Mary was based on his sister, Christina, Saint Anne on his mother Frances, and Joachim was modelled on an old family servant known as "old Williams." To use such commonplace models as one's own family and especially servants for holy figures was atypical and daring, and only a few years later fellow Pre-Raphaelite John Everett Millais came under harsh criticism for using friends and family and a real carpenter as models for his 1850 work Christ in the house of his parents. Furthermore, The Girlhood of Mary Virgin was the first painting to be inscribed with the initials PRB, on its frame. In fact, Rossetti paid unusual attention to the frame of the painting, showing an early interest in decorating and artistically influencing every aspect of a finished piece. For him, this also involved embelishing the painting with poetry, and he wrote two sonnets to be read alongside the painting; one inscribed on the frame, another in the exhibition catalogue. His goal was to create a double work of art that blurred literary and visual categories. The year after his "reimagining" of the childhood of the Virgin Mary, Rossetti chose to continue his vein of religious scenes by painting the Annunciation; the moment where the Angel Gabriel appeared to the Virgin bringing news of her divine pregnancy. The Latin title quotes the Gospel of St Luke, translated as "Behold the handmaiden of the Lord." Rossetti creates a symbolic consistency by continuing the depiction of the Virgin Mary alongside lilies which were often used as a symbol of purity in Italian Renaissance and Medieval art. Here, indeed, Gabriel presents Mary with the lily as a symbol of her eternal virginity and purity. Both Mary and Gabriel are swathed in virginal white robes with golden haloes, and backed with the rich royal, heavenly blue typically associated with Mary. A rich red panel stands in her bedroom, also with a decorative lily motif. When the painting was exhibited at the National Institution in 1850, it came in for harsh criticism for Rossetti's brazen re-imagining of the Annunciation. Mary, rather than kneeling for prayer, is depicted in her crumpled bed, in a long, creased white nightgown that was typical of a newly-wedded bride. For his part, Gabriel is shown without wings, and swathed in a loose white gown exposing his bare thigh and hip. Both figures seem ethereal, yet also real flesh and blood (again modelled on Rossetti's own family). A critic from the Athenaeum was caught off-guard by Rossetti's disregard for traditional Annunciation scenes, calling it "a work evidently thrust by the artist into the eye of the spectator more with the presumption of a teacher than in the modesty of a hopeful and true aspiration after excellence." Rossetti never exhibited the painting in public again, and in the 1850s he distinctly turned away from elaborate biblical scenes and towards female portraiture. By the time he completed Bocca Baciata (in 1859), Rossetti had been in a nine year relationship with Elizabeth Siddal. In that time he produced dozens of adoring sketches of his future wife (they were married in 1860). However, the model for this, the first of his painted female portraits, was not Elizabeth, but his mistress, Fanny Cornforth. Whereas he sketched Elizabeth as a beautiful, ethereal being, Rossetti painted Fanny as his ideal of sensual desire and allure. Rossetti based his painting of Fanny on a sonnet, Decameron, by the fourteenth century Italian writer Giovanni Boccaccio. On the reverse of the canvas Rossetti had inscribed a line from said sonnet, "Bocca baciate non perda ventura, anzi rinnova come fa la luna," which translates as "The mouth that has been kissed loses not its freshness; still it renews itself even as does the moon." Contained by the tight framing, against a flat decorative background, and seen only from face and shoulders up, Fanny has been effectively removed from her environment. Her pink, slightly parted lips are the central point of the frame, and her loose red hair (historically, a sign of loose morality) flows in long ribbons around her shoulders while her unbuttoned blouse reveals bare flesh. And once again calling on religious symbolism (the fable of The Garden of Eden), Rossetti places an apple on the table in front of Fanny thus confirming Fanny's allure and her powers of temptation. Unsurprisingly perhaps, the painting received a mixed reception, not least from Rossetti's pious Brotherhood colleague Holman Hunt, who described the painting as "gross sensuality of a revolting kind." However, other critics and friends of Rossetti were enthralled by the painting. The poet Algernon Swinburne said that the picture was "more stunning than can be decently expressed" while artist Arthur Hughes commented that it was "such a superb thing, so awfully lovely" that he wouldn't be surprised if the paintings owner (George Price Boyce) tried to "kiss the dear thing's lips away." By 1862, Rossetti had become disassociated with the original Pre-Raphaelite Brotherhood, and formed closer working bonds with William Morris and Edward Burne Jones both of whom appreciated Rossetti's aesthetic sensibilities and his dedication to medieval myth and legend. Rossetti was a founding member in Morris, Marshall, Faulkner & Co in 1861, and in the ensuing years he worked with the company on its decorative art designs. In 1862 he designed six stained glass panels for the windows at Harden Hall, West Yorkshire relating to the legend of St George and the Dragon (a rare excursion into British medieval history). The Morris & Co company became well known for their complex and vivacious designs, and Rossetti boasted that "Our stained glass may challenge any other firm to approach it." Rossetti's passion for the legends and romance of the past are captured in the wildness, violence and sensuality of tales such as St George and the Dragon. High quality colored glass was used for the panels, and an innovative color palette was set by Rossetti, drawing on some of his favorite shades; dazzling whites and golds, rich royal reds and olive greens. His narrative cycle for the stained glass designs was vivid and action-filled, with dense decorative pattern in a flat medieval style. In this panel, the princess is tied to a tree, almost swooning, and stripped to the waist, while Saint George, bedecked in gleaming gold armour, slays the Dragon. It is noticeable that the princess, with long pale limbs and lose, wavy flaxen hair, bears a resemblance to many of Rossetti's muses. We also find evidence Rossetti's devotion to poetry and storytelling as each panel is accompanied by a caption in curling, medieval script which read here as: "How the good Knight St George of England slew the dragon and set the Princess free." After a few years, Rossetti tired of working in the decorative arts, and his relationship with Morris became strained. It is true that he produced fewer pieces than the other founders of Morris and Co.. But his designs show how Rossetti acted as an important link between the Pre-Raphaelites and Morris's Arts and Crafts Movement. There is a story about Rossetti that tells how, immediately following the death of his beloved Lizzie, the artist felt a sudden compulsion to create a funerary painting in her honor. This is true to an extent, but Rossetti actually reworked the material of an unfinished portrait into a new composition that became his eulogy to his wife. 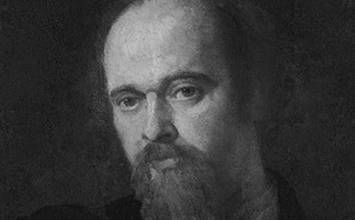 Rossetti saw himself as a spiritual descendent of his namesake, Dante Alighieri. The Italian poet had been dedicated to Beatrice Portinari, his muse and inspiration. She appeared as a character in two of his greatest works; La Vita Nuova and the Divine Comedy, and in the latter (written between 1308 and 1320) she is immortalized as a higher, spiritual being, who acts as a heavenly guide for Dante on his journey through Hell. Rossetti preferred to represent, possibly out of a feeling of guilt, an idealized, beautifully mournful version of Elizabeth, rather than try a represent the reality of her addictions and/or the downsides of their tumultuous relationship. Elizabeth is pictured, not at the moment of her death, but rather in a state of "sudden spiritual transfiguration." She is represented as an ethereal figure, crouching, in a state of ecstasy, as if she is about to receive communion. Her eyes are closed and her head tilted upwards and she is surrounded by a soft golden glow. The rest of the colour palette, however, is muted, and as Rossetti's friend F.G. Stephens noted, the grey and green of Lizzie's dress signify "the colors of hope and sorrow as well as of love and life." Yet the painting does feature a darker symbolism in the form of the red dove. The red dove, the symbol of the Holy Spirit coming to take her to the Afterlife, descends on Elizabeth, depositing a poppy in her upturned hands. This feature acknowledges the beauty and deadliness of the Poppy; the flower that brought about her death through Laudanum adiction. The dove also had a personal meaning, as "Dove" was Rossetti's nickname for Elizabeth. In the background, meanwhile, Dante cuts a shadowy figure, facing an indistinct red-cloaked woman who represents Love who holds a flickering candle, as the flame of Beatrice's life begins to fade. As a direct homage to Alighieri, a sundial, surrounded by golden light, points to the time of Beatrice's death: 9 o'clock on the 9th of June, 1290. 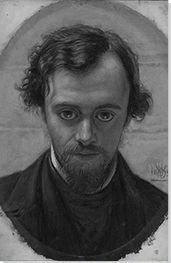 By 1874, Rossetti was in the grip of a mental breakdown, a decline not helped by an addiction to chloral hydrate and alcohol. Still residing at 16 Cheyne Walk, he was nursed in the last ten years of his life by Fanny Cornforth, and visited regularly by his lover, Jane Morris. Rossetti had become somewhat obsessed with Morris in fact; the one woman he never fully possessed due to her unhappy marriage to William Morris (with whom, it is said, she stayed married for the sake of their children). However, during 1870s, Rossetti painted many portraits with Jane as his model. Here, with her ruby red lips, thick raven hair, elongated neck, and dressed in a flowing blue silk gown, she is the very picture of elegance. However, though she possess a serene beauty, her expression is distant and she seems somewhat forlorn. Though Proserpine is dated 1874, it was in fact painted and repainted no less than eight times over the decade which provides a strong hint of Rossetti's obsession with Morris. In this composition, she is refigured as the Goddess Proserpine, whose legend closely mirrored the pair's own relationship. In the myth, Proserpine must travel to the underworld and leave behind her true love, Adonis (Rossetti). While in the Underworld, she unwittingly eats six pomegranate seeds (represented here), obliging her to remain in the Underworld with Hades (William Morris) for six months of the year as his wife. Only in the six summer months can Proserpine return to Adonis in the sunshine of the above world. Like Proserpine, Jane had felt contracted to her marriage but during the summer months, while William Morris was renovating their home, she and Rossetti stayed in Kelmscott Manor where they were free to pursue their love affair. Admitted at my distant palace-door. The nights that shall be from the days that were. "Woe's me for thee, unhappy Proserpine!"